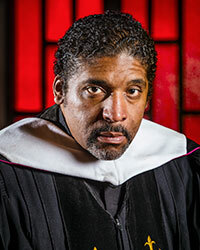 The Reverend Dr. William J. Barber II is the president and senior lecturer of Repairers of the Breach, cochair of the Poor People’s Campaign: A National Call for Moral Revival, and pastor of Greenleaf Christian Church in Goldsboro, North Carolina. A visiting professor of public theology and activism, Rev. Dr. Barber is also the author of The Third Reconstruction.